Blue John is a variety of fluorite. Fluorite is extremely good for balancing, clearing energy blocks, organising thoughts and ideas, and for keeping the aura clear. Therefore, fluorite alleviates chaos, and can be extremely helpful for people learning new subjects, taking exams, or embarking on large projects or creative endeavours – especially projects which involve a great deal of forward planning or which grow as the project unfolds, making it difficult to see or remember the structure within. It acts as “psychic Teflon” for healers and other practitioners (I’ve been calling it this for years, and only recently discovered it is actually used in the making of Teflon), as it allows us to empathise and feel with others without holding on to their problems or illness. It calms and centres, and creates inner expansion, bringing stillness and an ability to work through difficulties without stress. On a physical level, fluorite can be used to strengthen and promote healing in bones and teeth. While cubic fluorite crystals can be gently grounding, the octahedral shape is calming, and brings clarity in times of confusion. Blue John shares the properties of rainbow fluorite and violet fluorite. 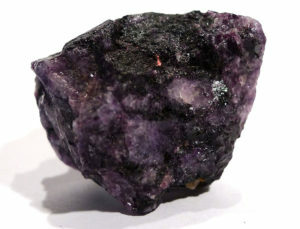 However, it is more of an earthbound workhorse than violet fluorite – I mean that in a good way. It works its way through the physical body, cleansing, balancing and relaxing as it goes. Blue John is massive fluorite, exclusive to Derbyshire. It shows distinct banding of purple with yellow or white, and sometimes green. Purple with yellow is the most common colour combination.